The complexity of tough issues can only be handled effectively with intensive local participation. Such participation is not straightforward as people may shy away from the unfamiliar repertoires, unpredictable processes and inevitable opposition that come with the territory. 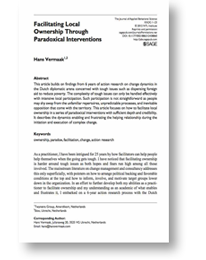 This paper focuses on how to facilitate local ownership in a series of paradoxical interventions with sufficient depth and credibility. It describes the dynamics enabling and frustrating the helping relationship during the initiation and execution of complex change. This paper builds on findings from six years of action research on change dynamics in the Dutch diplomatic arena concerned with tough issues such as dispensing foreign aid to reduce poverty. The article is based on a previous paper presented at the Academy of Management in 2010. It was awarded as the best paper based on a dissertation by its Management Consultancy Division. It was also shortlisted for the William. H. Newman all academy award for the same reason.